It’s often said, the only constant in life is change. This sentiment is largely true. In 1953, a gallon of gas cost 29 cents – milk cost 94 cents, and a new Ford was $1,500. Although, there is one constant that has remained the same since 1953 – Ray C. Reynold’s membership and loyalty to Laborers’ Local 534. Ray was born April 20, 1935, in nearby Campton, Wolfe County, Kentucky. He moved to Ohio with his sister at the age of 16 shortly after their father passed. Just two years later Ray joined Ohio Laborers’ Middletown Local on August 6, 1953. Early within Ray’s laboring career he met and married his wife, Jo, in 1957. Ray was able to support the young couple along with four children on what he recalls $190 per week. The wage Ray earned was enough for the family, enabling Jo to become a homemaker for the family. Throughout Ray’s membership, he has been a model Laborer. Raystarted as the personal driver for Mr. McGraw until his passing, and then for Mrs. McGraw for several more years. The McGraw family business would later be known as McGraw-Kokosing Construction. He also has satisfaction in knowing he helped shape the community he lives in. One project that Ray takes particular pride in, is the construction of the original Jeremiah Morrow Bridge which is the tallest bridge in the state. 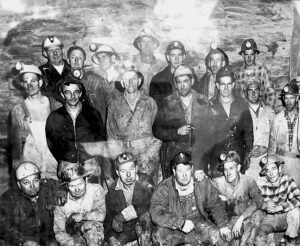 Ray remembers his early memories of being a Laborer while working for the McGraw family in glowing fashion. “I’m proud to have the ability and position to help members like Ray, string together multiple part-time jobs into a meaningful career,” says Business Manager of Local 534, Jeff Root. 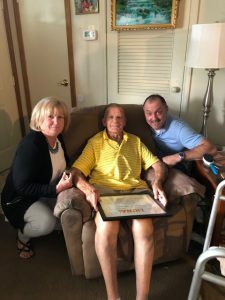 He continues, “This profession has family-sustaining wages, pension, and insurance our members can rely on.” Root was present to recognize Ray’s milestone, along with Secretary-Treasurer Saundra Napier, and Field Representative – Bill Napier. Ray continued his storied career with McGraw-Kokosing until the summer of 1991. The defined pension benefits he has earned sustained both he and his wife until her passing in 2016. Today, Ray leads a quiet life and is frequently visited by his children and grandchildren. He is acquiring quite the collection of milestone gifts due to his dedicated membership to the Local. He assures the Local 534 office that he’s looking forward to the next one just five years from now.